When: Sunday, April 9th. Check in at 9:00 a.m.
Where: Franklin, TN. We are currently waiting for confirmation on the exact field locations and times. As soon as we receive confirmation, we will update the website and contact those who have already registered. TSC is the first and only club in the state of Tennessee to be awarded membership into the ECNL. The purpose of this Clinic is to help the TSC staff identify players who can compete at the ECNL level and who are interested in playing for TSC's ECNL program for the 2017-2018 season. Player identification will be handled by the TSC coaching staff, the TSC ECNL Director and the TSC Executive Director. 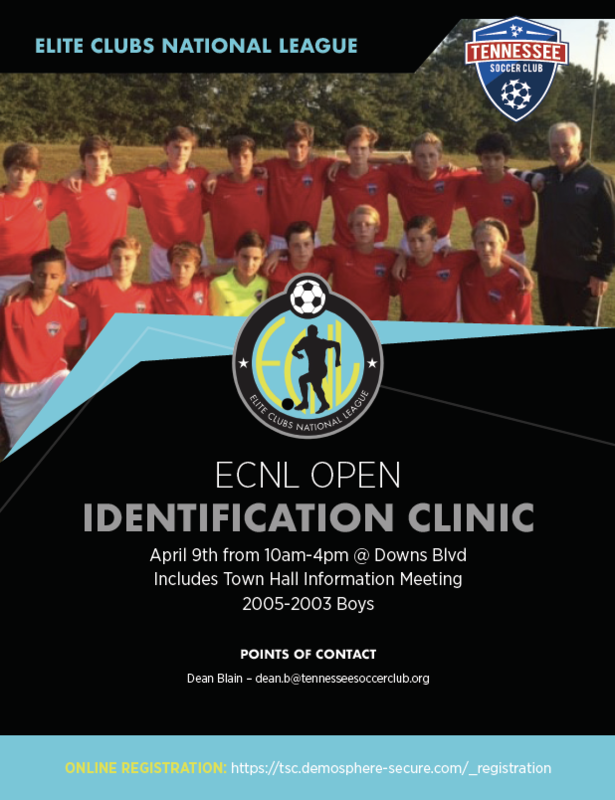 Please note that no ECNL roster spots will be assigned or given out at the conclusion of this clinic; it is for identification purposes only. In addition to on field training and evaluations, the clinic will also include a Town Hall style information meeting regarding such topics as the structure and organization of the TSC ECNL Program. During the meeting, parents and players will also be afforded the opportunity to ask any questions they may have about the TSC ECNL program.